Brush Cherry is an evergreen tree or shrub, some of which have been reclassified to the genus Syzygium. The dark green ovate leaves are formed in pairs and are firm and glossy. In spring, the Brush Cherry - Eugenia – may bear small white flowers followed by red fruit only some of which are edible. The dried buds of the Eugenia aromatica (Syzygium aromaticum) become fragrant “herb” cloves. Brush Cherry do best outdoors. They grow best in high light and thrive in sunny, warm locations. The Brush Cherry can tolerate full sun but partial shade is recommended in the hottest areas. Use a humidity tray to keep moisture levels up. Although some people leave their Brush Cherry outside during the winter, it should never be allowed in temperatures below 30º F. Do not position near a heat source or in drafts. It does not like a lot of variation in temperature. The more sunlight and warmth your Bonsai receives, the more often it will need water. More Bonsai die due to improper watering than any other cause. Check your Bonsai by occasionally sticking your finger into the soil. Do not water the tree if the soil is damp or cool. Brush Cherry bonsai do not tolerate salt. Use distilled/rain water if your water is hard, or full of minerals. When the topsoil feels dry, water thoroughly and deeply. An old Bonsai watering trick is to place the entire pot in a sink of water an inch or two deep. Let the water absorb from the holes in the bottom of the pot. An inexpensive moisture meter takes the guesswork out of watering. We sell them on our website. Leaves want humidity to keep them green and healthy. Any time your tree is inside, the air is very dry. 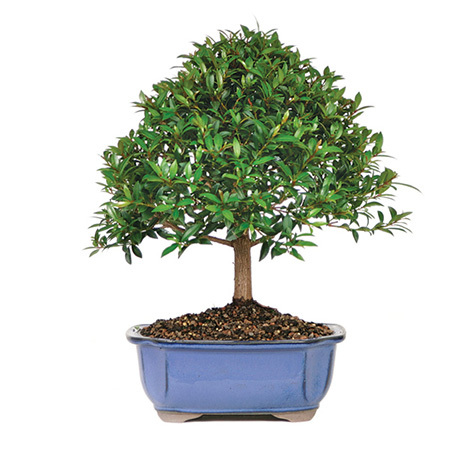 Avoid putting your Bonsai near a draft or heating/air conditioning vent which dries out the foliage. Fertilizing a Bonsai is essential to its health because nutrients in the soil are washed away with each watering. Fertilizer is like vitamins and minerals for a plant. When new growth appears in the spring, it’s time to start feeding your Bonsai. Use an acid based fertilizer. Most Bonsai should be fertilized once or twice per month during the growing season and once a month in the winter. Water your tree BEFORE fertilizing. Brush Cherry bonsai like slightly acid soil, so the occasional use of Miracid is recommended. DO NOT FERTILIZE A WEAK OR FRESHLY REPOTTED TREE! This will cause stress to the tree by burning the roots. To keep a Bonsai miniature, it needs to be trimmed and pruned as new growth appears. Never remove all the new growth at one time. Shape is determined by the overall look that you want to achieve. Sit at eye level with your Bonsai tree and use Bonsai trimming shears. Your cuts should be smooth or slightly concave so the wound will heal quickly. Brush Cherry grows vigorously and may need to be pruned often to maintain its shape. Shorten new shoots with 6 to 8 pairs of leaves to 1 to 2 pairs. Leaf pruning is not generally advised as better leaf reduction results from timely pruning and this plant has relatively small leaves in the first place. Brush Cherry can be wired, but better shaping results are achieved with pruning. Use the thinnest training wire that will hold the branch in the desired position. DO NOT WIRE A BONSAI JUST AFTER REPOTTING. Wind the training wire in the direction the branch is bent in order to keep the wire from loosening. Wrapping the wire too tightly will cause scarring. Protect the Brush Cherry branches as they scar easily. Wrap just tight enough to get the job done. Begin at the base of the Bonsai tree and slowly wrap the wire around the trunk to anchor. Continue along the branch you wish to train. Repeat the process as needed. After about 6 weeks, the branch should be able to maintain the shape on its own, and the wire can be removed. Cut the wire carefully from the branch. DO NOT UNWIND WIRES. This could cause the branch to break. A Bonsai should be repotted periodically to supply the plant with fresh soil. When the roots can be seen growing out the sides of the Bonsai container … it’s time. Prune roots moderately every two years in early to mid-spring. Use basic bonsai soil, or an acid mix like azalea soil. After repotting, water thoroughly. DO NOT FERTILIZE FOR 3-4 WEEKS. Brush Cherry – Eugenia – can be attacked by scale, mealy bug, Caribbean fruit fly, aphids, and red spider. These can be attacked with the use of insecticides and fungicides in the form of sprays, soapy rinses, or systemic poisons. Spraying your Bonsai once every few months with a non-toxic insect spray is recommended. Soaps should be rinsed off the next day. DO NOT SPRAY WHEN SOIL IS DRY. Aphids are soft-bodied insects with pear shaped bodies. They cluster on buds, leaves and tips of shoots. Aphids feed on plant juices causing poor plant growth and distorted leaves. Most products used for aphid control work as contact insecticides. The aphids must be hit directly with spray droplets so they can be absorbed into the insect’s body. Insecticidal soaps work well against aphids. Mites also like to infest Bonsai. Identified by small moving pinpoints of red or brown on branch tips, severe infestations leave “spider webs” on branch tips and yellow leaves all over the tree. Scale is the most common insect that attacks a Bonsai. Scale is usually identified by brown or black bumps on the branches. These bumps contain insects under a protective waxy shell. A very sticky secretion that discolors the branches may also be present.